🔔 notifications in the context of the IndieWeb refer to all forms and ways that an independent web site can receive a message indicating something of interest (server notifications), and potentially relay that information (preferably in realtime) to one or more devices used by the owner of that site (client notifications). For server notifications, we use webmention and PuSH. There are numerous use cases for notifications, this is meant to capture a few that are currently real world and pervasive. calendar reminders - your site noticing your upcoming events and RSVPs and sending you an event reminder with details inline and URL for more info / comment / option to change RSVP. 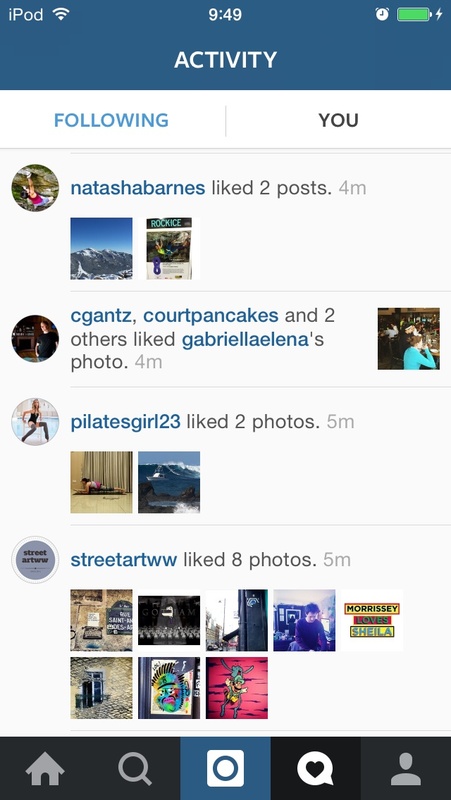 follow-up comment - someone commented on something you commented on, or liked. Once again, not checking notifications. Using web, not client. Too many notifications. Will check later. When attempting to focus one's attention on specific projects or goals, being deluged with unrelated notifications can be very distracting. Every notification system needs facilities to get specific notifications to be quiet, temporarily or permanently. The lack of said modes may reflect a software vendor's desire for you to engage more with their service rather than respecting your time and resources. Ben Roberts has a notifications page at https://ben.thatmustbe.me/activity since 2015-05-07 that shows a summary of all notifications he receives, both to specific posts, and his homepage. gRegor Morrill has a notifications page (currently calling it a "responses" page) at http://gregorlove.com/responses/ since 2016-05. 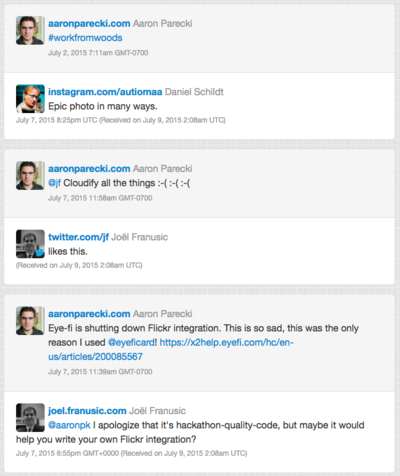 Primarily for me to have a quick look at recently-received webmentions + local comments. Includes homepage webmentions, though no additional processing is done on them, e.g. person-tag. Currently shows latest 20; may add pagination to go back further. Sven Knebel has a private IRC server where a bot (based on TikTokBot [reports new webmentions]. Aaron Parecki has a private IRC server where notifications of new webmentions are reported. For the plaintext representation, displaying the author name is not particularly useful, since people often put random junk into the "name" field. A compromise would be to show the author as "Author Name (url)" in plaintext form. 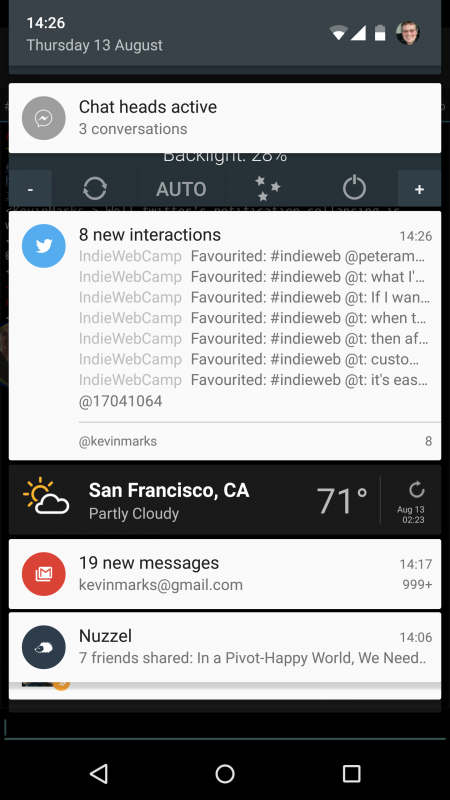 In environments with lots of notifications or notification bursts, you may want to cluster notifications together. Here's a description of that feature and the algorithm that webmention.io uses: Clustering notifications. "Push notifications", also known as "client notifications", are notifications that show up on one or more of your client devices without you having to explicitly request them (hence "push"). No replicable indieweb solutions to Push Notifications yet. See the main push notification page for projects and brainstorming. Aaron Parecki's site aaronparecki.com receives webmentions and then sends them to his own IRC channel, which then sends a push notification to his phone when his IRC status is "AFK" status. The notification sends just the two URLs (source, target), and the type of webmention, e.g. reply, like, etc. mention-app (see Projects below) is his eventual goal. Marty McGuire's site martymcgui.re receives webmentions at webmention.io, which is configured to send a notification to a webhook running on his site. That hook uses Pushbullet to send a push notification to his phone and other devices. 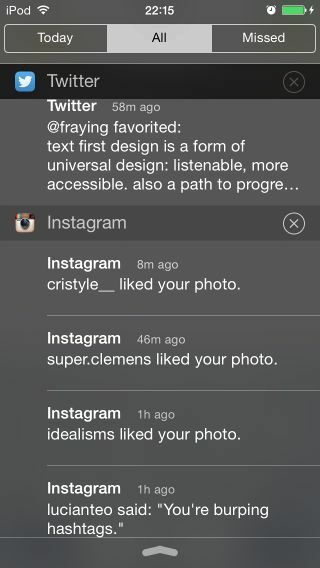 This iOS 7 "recent items" notifications example shows 2-3 different kinds of notifications from two apps, a favorite, several likes, and a reply. "favorited:" vs. "liked" (no colon) vs. "said:"
Some presentations of some notifications like these "recent items" begin to look like "cards". As of 2018, Facebook shows a bell (🔔) icon in their header for notifications, instead of a globe that is rotated to your current location (🌎🌍🌏), on both web and mobile web versions of their site. Some of these entries have no permalink and only link to referenced post. The also appear to be time sensitive and cannot be recovered after a certain amount of time. If you receive Facebook notifications via email you may be able to search your email archives for older notifications. This screenshot shows Facebook's current notifications UI after browsing to the "Show All Notifications Page" and expanding the notifications menu bar. Clicking on any notification brings up the post that is being discussed, but there is no known way to get to a post with this exact content"
Also on the far right are activity from friends on facebook which has some of the same properties though seems to have more post content included in them. Facebook notifications are also available as feed files! https://www.facebook.com/feeds/notifications.php?id=214611&viewer=214611&key=AlphaNumericKey001&format=rss20 where AlphaNumericKey001 is some key specific to you, security through obscurity as it were. JSON: change the "format=rss20" to "format=json" in the RSS URL and you'll get a JSON feed file instead with roughly Atom semantics. As of 2017 (or earlier), Instagram uses a heart (empty by default, filled when chosen) in its bottom bar for "notifications" (since most of their notifications are likes which they display as hearts). 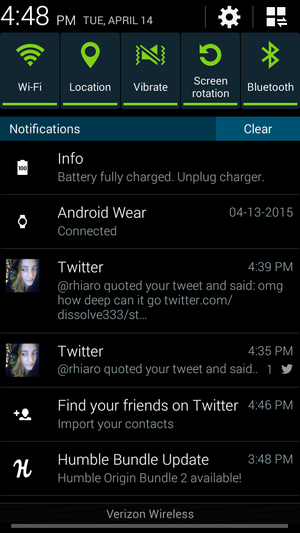 When notifications are available, they show a heart with a dot underneath. If you then tap the "FOLLOWING" tab at the top, it becomes highlighted in blue and shows similar notifications/activity by and for those you follow (for the most part that is, it doesn't show you when people follow the people you are following). Twitter (as of 2017 at least) uses a bell (🔔) icon in the logged in header to link to your notifications page. When you have notifications, a number is shown in a circle on the top right of the bell. favorites of your tweets, e.g. 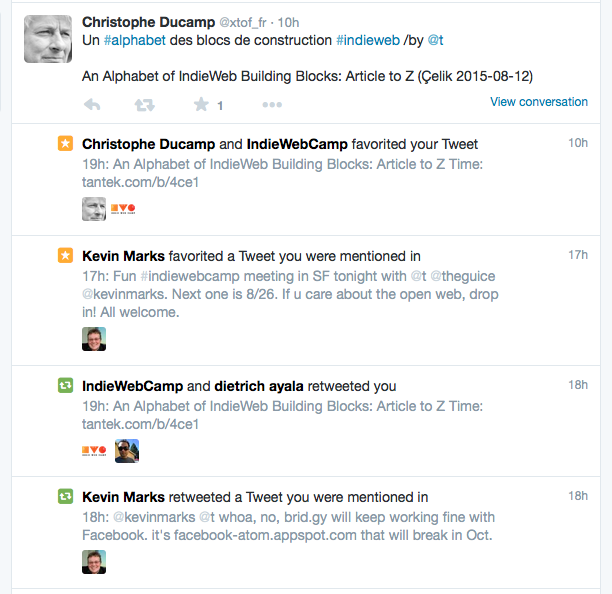 "Christophe Ducamp and IndieWebCamp favorited your Tweet "
favorites of tweets you're mentioned in, e.g. "Kevin Marks favorited a Tweet you were mentioned in "
reposts of your tweets, e.g. "IndieWebCamp and dietrich ayala retweeted you "
reposts of tweets you're mentioned in, e.g. "Kevin Marks retweeted a Tweet you were mentioned in "
See also: mentions silo examples: Twitter. GitHub shows a blue dot above the notifications icon (a bell) to indicate there are unread notifications. Notices are divided by project. Each entry shows the title of the issue/PR and an icon indicating what type of action it is (new issue, comment, pull request, PR merged, issue closed). Note/Criticism: there is very rarely enough context on this page to triage notifications — you almost always have to click through to the issue itself to see what it's referring to. There is evidence of demand from IndieAuth consumers (clients) e.g. that Gitea OAuth Github thread, that they want a way to notify such SSO users. Ideally this would be a formally specified Notification Protocol that could be used by any service to notify users of that service, via the URL they used to identify themselves. In order to provide some amount of privacy, these notification permalinks could be obscured "capability URLs", public, but unlinked from elsewhere (except your logged-in private notifications page listing them all). For further privacy enhancement, use a private-webmention to send the notification.